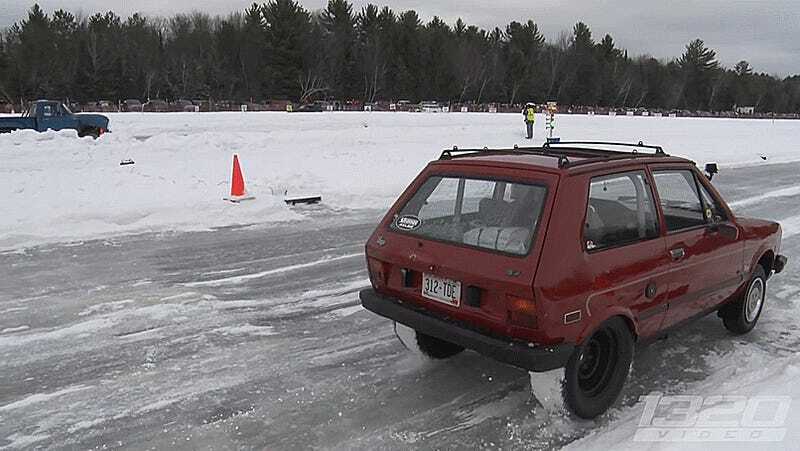 We here at Jalopnik have cracked the secret to true joy, and it involves a tiny Yugo, a big V8 engine and a nice afternoon of ice drags. This cute little Soviet Bloc hatchback reaches over 100 mph in the 1/8 mile. It’s just what we all need. This is a 1988 Yugo GV weighing just 2,200 lbs with a 5.3-liter LSX V8 engine swapped into it, notes Dragzine. My only question is, why didn’t Yugo build their cars like this from the factory? With big meaty studded tires helping his car grip and nitrous feeding more power into the engine, driver Jake Bloechl fired off a fantastic 7.88-second, 101 mph pass in the Yugo. I repeat: in a Yugo. It doesn’t always win, but the Yugo certainly looks like the most fun seat at the drags. I’m sorry, Mike. We’re going to have to steal your car now and do horrible but wonderful things to it.